Biometric fingerprint authentication is still in its infancy and often seen as a ’gimmick’/nice to have. However, businesses and consumers should not be operating under this misapprehension as fingerprint biometrics can play a much wider role in unifying the technology we have grown to depend on. For example, many of us now rely on our fingerprints to access our smartphones and authenticate our mobile payments, but fingerprint biometrics has far greater potential to positively influence other tech-enabled areas of our lives. More and more devices can now instinctively ’talk’ to one another, whether it’s via Bluetooth, NFC or Wi-Fi and as such, personal data is exchanged to positively influence and unify the user experience. For example, smartphones often connect to, and are used to monitor and manage other smart devices, such as smart home hubs, smartwatches, fitness trackers, even scales. While there are many benefits of leading a digitally led lifestyle, the more our lives are connected and the technology we use is linked, the more we open ourselves up to cyber threats. If a cybercriminal can gain access to one weak device within a unified network of devices, they can access all the associated devices, along with the sensitive data each device holds. By adding fingerprint biometric authentication as a layer of security we can ensure the right person is accessing the right device, building or system. 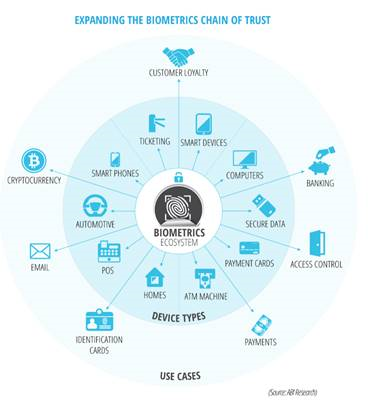 The chain of trust that fingerprint biometrics offers can be implemented to provide businesses and consumers with a far greater level of confidence in keeping their unified networks secure. If we take a closer look at the consumer landscape, fingerprint biometrics can be used to authenticate access to homes through internet-enabled locks and utilities can be managed via home hubs, but consumers can now also use the internet to manage white goods to wash clothes, keep the fridge stocked and to remotely monitor dinner as it cooks in the oven. However, the advantages of fingerprint biometric authentication applied to consumer environments can also be used to strong effect in corporate environments. Every business needs to be confident that their premises, belongings, data, stock and employees are safe, secure and protected. Fingerprint biometrics provide businesses with a flexible and affordable option to determine exactly who can gain entry to specific areas within a building, or to devices themselves. Removing the need for pin codes, passwords, fobs, swipe cards or keys - all of which can be lost, stolen, lent and forgotten and come at a cost. By applying fingerprint biometrics to smart biometric cards, authentication will put who we are back at the centre of authentication, rather than what we can remember, or write down in many cases. Providing an ideal balance between usability and security, as we carry our fingerprints with us. The added benefit of on-card biometric fingerprint technology means a fingerprint biometric profile can be securely stored on the card itself and not in several databases owned by the card issuers or device manufacturers - limiting potential exposure and risk. This isn’t the only benefit of having one biometric smart card across a network of unified devices. Fingerprint enrolment itself can prove extremely time intensive, particularly across multiple devices, so a user-friendly process is imperative to adoption. By having just one card to authenticate all devices, users will only have to carry out the enrolment process once, rather than multiple times. Whether we are aware of it or not, technology is becoming increasingly unified and if one device is targeted by a hacker, they have the potential to access a whole wealth of personal and corporate data held on a myriad of devices and networks. The reality is not just ’if’, but ’when’ these breaches will happen, and we must be ready for them by implementing heightened security practises - including fingerprint biometric authentication. Biometric access control can seem futuristic, but in fact, offers many advantages over standard security solutions and is surprisingly affordable to roll out. Fingerprint biometrics present a unique opportunity to create a secure unified technology chain of trust that can safeguard against human error, laziness and cyber threats while making the authentication process easier than ever before.